Proper implementation of these techniques will go a long way toward eliminating feedback. The answer: no such microphone exists. Feedback results from a combination of many factors, including loudspeaker placement, microphone placement, and the frequency response of both devices and room acoustics. It’s a complicated process. Entire books have been written on the subject and the mathematical formulas that model feedback are quite involved. So let’s summarize the problem. Feedback is an oscillation at a resonant frequency of your sound system and the room. Take a soda bottle and blow over the top. It will resonate at a certain frequency depending on the volume inside. Change the inside volume by adding liquid and the resonant frequency changes. Feedback is analogous to blowing over the bottle top. Each mic is slightly different; therefore each one will resonate at different frequencies. Each loudspeaker is slightly different and will resonate at different frequencies. Each location in the room has its own resonant frequency. As the gain of your sound system is increased, eventually a common resonant frequency is found and the system (mic – loudspeaker – room) goes into feedback. Change one component, or location, and the feedback will also change. The resulting noise is a sustained, ringing tone, which can vary from a low rumble to a piercing screech. The root causes of feedback are irregularities in the frequency response and polar patterns of the microphones, the loudspeakers, and the room acoustics. Consider this example: You have three Shure SM58 mics, but the manufacturing tolerance of those mics over the complete frequency range is +/- 3 dB. At any certain frequency, two of your SM58s might have an output variation of 6 dB. Loudspeakers are even worse with many having variations of +/- 6 dB, which equals a range of +12 dB. And room acoustics can boost certain frequencies due to room resonance as much as +/- 12 dB! This is a range of 24 dB. With this much variation, it’s no surprise that mics in slightly different locations will feed back differently. Also note that each time the number of open mics in a sound system is doubled (1 to 2, 2 to 4, 4 to 8, etc. ), the overall gain of the sound system drops by 3 dB. This means that more open mics equal less gain in the PA system. Simply stated, feedback occurs whenever the sound entering a microphone is reproduced by a loudspeaker, picked up by the microphone, and re-amplified again and again. The familiar howl of feedback is an oscillation that is triggered by sound entering the microphone. The easiest way to create feedback is to point a microphone directly into a loudspeaker. (We don’t recommend you try this!) 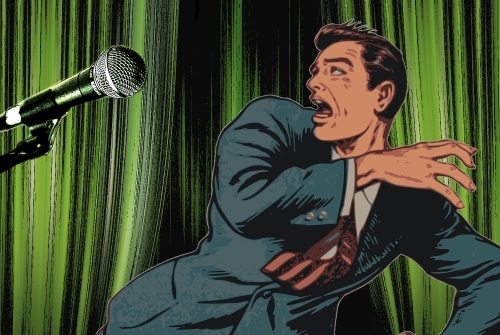 Placing the microphone too close to the loudspeaker, too far from the sound source, or simply turning the microphone up too loud exacerbates feedback problems. What can I do about feedback? —Change the acoustics by adding sound absorbing material walls. —Change to different mics that have different resonance frequencies. —Use in-ear monitors to eliminate the feedback path from loudspeaker monitors to mics. —Employ precise parametric equalization that might add 4 to 6 dB of gain. Change to loudspeakers with a very smooth frequency response at all frequencies and all angles (big money!). —Try to keep microphones and loudspeakers as far away from each other as possible. When all of these solutions have been exhausted, the next step is to look at equalizers and automatic feedback reducers. A common technique used by sound engineers is “ringing out” a sound system by using a graphic equalizer to reduce the level of the frequencies that feed back first. After the techniques described in the above section have been applied, slowly bring up the system level until you begin to hear feedback. Now go to the equalizer and pull down the offending frequency (roughly 3 dB). If the feedback is a “hoot” or “howl,” try cutting in the 250 to 500 Hz range. A “singing” tone may be around 1 kHz. “Whistles” and “screeches” tend to be above 2 kHz. Very rarely does feedback occur below 80 Hz or above 8 kHz. It takes practice to develop an ear for equalizing a sound system, so be patient. After locating the first feedback frequency, begin turning up the system again until the next frequency begins ringing. Repeat these steps until the desired level is reached, but don’t over-equalize. Keep in mind the equalizers can only provide a maximum level increase of 3 to 9 dB. Parametric equalizers, though more confusing to the novice user, allow for more precise control of feedback frequencies. A graphic EQ allows the user to cut fixed frequencies with a fixed filter width. A parametric EQ allows the user to isolate specific frequencies and adjust the width and depth of the filter. Automatic feedback reducers will accomplish the same results. They find and cut the frequencies that are feeding back automatically. The same precautions listed above apply to feedback reducers as well as equalizers. Automatic feedback reducers are very helpful in wireless microphone applications. Remember that microphone placement is crucial to eliminating feedback, and the temptation to wander away from the ideal microphone position when using a wireless mic is great. If the performer gets too close to a loudspeaker, feedback will result; a good feedback reducer will be able to catch and eliminate the feedback faster than a human operator. Proper implementation of these techniques will go a long way toward eliminating feedback in your sound system. Don’t rely solely on equalizers or feedback reducers, and remember that feedback results from more than just the microphone. This article was contributed by Shure.